President Trump probably didn’t realize what a hullaballoo he would set off by casually inviting Russian President Vladimir Putin to the White House, but the reaction showed how behind the times the MSM is. Losing their proverbial cool, newscasters point out indignantly that when the US invites a foreign leader to the sanctum of sanctums, it is a sign of favor, that we recognize him or her as a trusted ally. 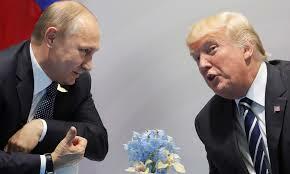 How could the president do this with Putin, who is an adversary? And could he be trusted alone in a room with a former KGB leader? One of the contradictions that never ceases to amaze me is the MSM’s ceaseless refe-rences to Vladimir Putin as a former spy, while at the same time criticizing President Trump when he attacks our own spies. Oblivious to the fact that the US has two such organizations, the CIA and the FBI, journalists appear to believe that American spies are in a different category from Russian spies, (clean, noble, versus brutal, dirty, etc.). Moreover, each time a new Russian player is introduced to television audiences, he/she is presented as “having ties to the FSB”. Seeing the US media’s reactions to their up-coming summit, the Russian president might suggest to Trump that a neutral location would be best. Helsinki comes first to mind, which, in the mid-seventies, hosted a process (the Helsinki Accords) that ultimately led to the end of the Cold War. Another possibility might be Iceland, which though considered part of Europe, keeps its own, original counsel. Then of course there are the two presidents’ favorite warm haunts: Trump’s Mar al Lago and Putin’s Sochi. Today, as the media condemns for the nth time Donald Trump’s preference for authoritarian rulers, it appear to ignore the fact that in a world of increasing complexity, direct diplomacy between leaders is the new normal among the growing list of countries that no longer want to be free to obey. Meanwhile, Morning Joe could hardly be expected to forego the inputs of former ambassador to Russia Michael McFaul, and doyen of anti-Russian writers Timothy Snyder, who are like a two-faced Janus. Both have new anti-Russian books out, the ambassador not hiding his frustration that the academic’s is out first.